A nice rainy day can be just the ticket for getting things done. Two weeks into school and I’ve given up my Summer lovin and am ready for a nice Fall cool down. I want to do some knitting! Such a great book choice! I love the Betsy-Tacy-Tib series. i LOVE the book cover in that photo! is it an old book? i’ve never heard of that series. of course i have boys, not girls, so that might be the reason. That’s my favorite series from when I was a child. And that is such a lovely image. I HAUNT book sales for Betsy books of this vintage and have never found one. How do you do it? So pristine! Oh, to be Betsy! I read the series over and over and introduce it to my fifth graders as well. What a wonderful world Mrs. Lovelace created! The Betsy-Tacy books are one of my all-time favorites. I never get tired of reading them. I love that afghan (?) in the photo. It makes me want to pull out my knitting needles too. Or, rather, my BIG knitting needles. I’ve been knitting socks all summer. I finished The Passage about a month ago. I totally didn’t know it was a series. I guess I’m sucked in now. I love Betsy-Tacy! What a great cover. I actually named my oldest daughter Tacy after Tacy Kelly and would have named the others Betsy and Tib if my husband didn’t think I was crazy. I love the Betsy Tacy books. Seek out the Milly Molly Mandy books for a similarly sweet book series beloved by British children. I love Maud Hart Lovelace’s books! 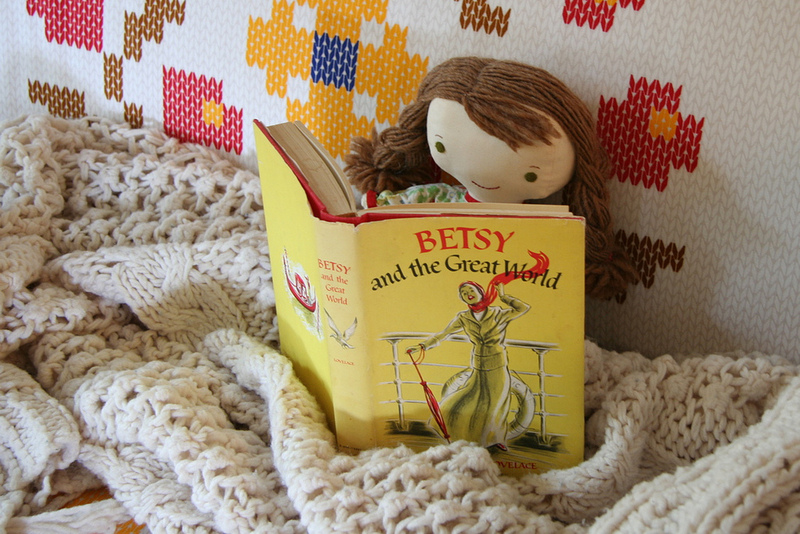 I first found your blog as the result of a google search for “Betsy Tacy”- one of the links that came up was for photos of your Betsy doll. Just bought the complete set of Betsy’s “grown-up” books last week. Love the afghan! Any chance you can get the name of the pattern from your mom?